John married Mary Martha Ann LEWIS (a Devon lass) in St.Botolph Without Aldgate in 1830. Very little is known about Mary other than she was born in either Plymouth (1861 census) or Exeter (1851 census) in about 1807 and died in Marylebone in 1873. At some point they moved to London to have their family – 3 sons and 3 daughters who were all born in Marylebone between 1836 and 1850. The eldest son was William MUSGROVE (born 1836) and he was also a shoemaker and a cordwainer carrying on from his father. On Christmas Day in 1859 William married a local girl, Ann SWAIN, in Christ Church, Marylebone – the MUSGROVEs and SWAINs were next door neighbours on the 1861 census at 29 Carlisle Street, Marylebone. They went on to have 2 sons and 3 daughters born in Marylebone and Paddington between 1861 and 1872 - the eldest being William John MUSGROVE. Prior to his death in 1895 he was living at Branstone Street (where is this ?). Ann’s parents were both born in Oxfordshire. Her father, William SWAIN, was born in St George’s about 1801 and was a gardener. Her mother, Caroline, was born in Madon Green in about 1807 and was a launderess. One of Ann's brothers, George SWAIN, was a furniture and cabinet packer. The photo above is that of a statue found in front of St Mary Aldermary in Watling Street in the City of London. This area of London was the shoe and boot making area and it still includes the Cordwainer Ward (a small local government district covering an area of just 270 meters by 130 meters). The word ‘cordwainer’ is derived from the name of the city of Cordoba in Spain, which was renowned for its fine leatherwork. 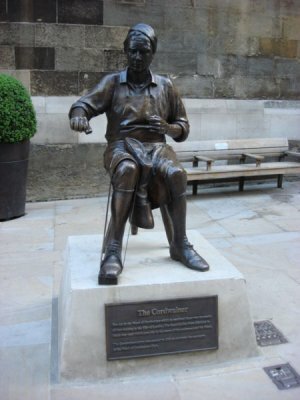 A cordwainer worked on particularly fine leather so only the more skilled shoemaker would work with it. Hence, describing yourself as a cordwainer meant you considered yourself to be a better class of shoemaker.